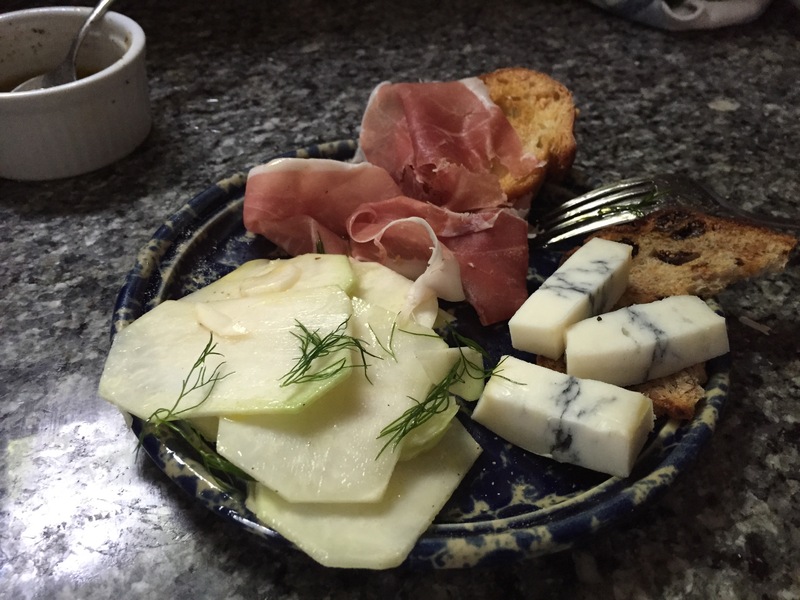 I love kohlrabi and before we started our CSA many years ago, I had never eaten before. Now, I look forward to seeing it sitting in the CSA baskets in the cool pick up area around the corner from the tree swing and hammock. This simple recipe is a great way to enjoy the slightly sweet, clean tasting vegetable that looks like a bulb. The common vegetable it reminds me most of is broccoli. For this recipe, I use a mandoline, but you can make it more of a slaw and use a grater as well. 2 tsp of another vinegar such as white balsamic, Champagne vinegar, rice or white wine vinegar. Trim the long stems and leaves off of the kohlrabi. Wash the kohlrabi. Wash the dill and set it on a kitchen towel to dry. 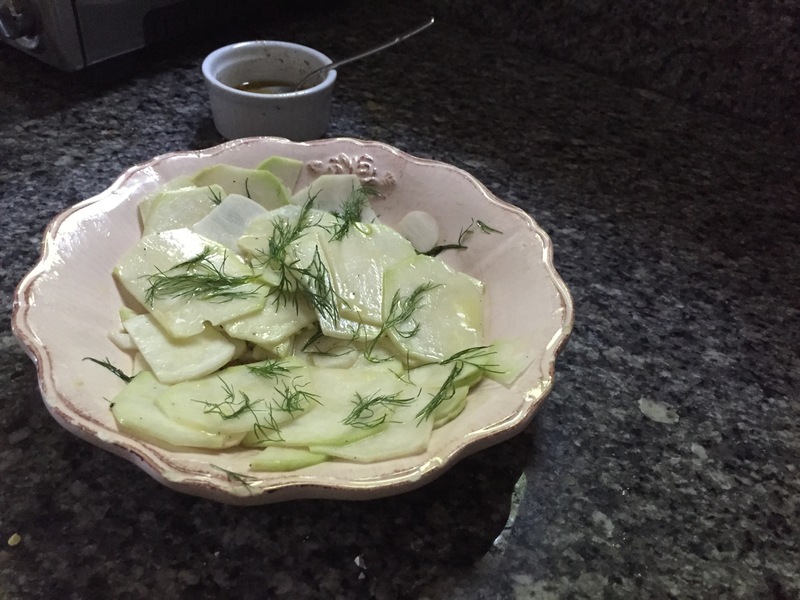 For a more delecate shaved salad, peel the kohlrabi, but it isn't essential. Using a mandoline on a thin setting (I used the 1/8 " setting on my Oxo Mandoline). If you do not have a mandoline just use a grater and you can have shredded strips of kohlrabi instead of larger rounds. Mix the vinegars and mustard in a bowl or jar. Add the oil, a pinch of Kosher or Maldon sea salt, and about 1/2 tsp of pepper. Whisk together with a fork until combined. If you do this in a jar you can just give it a great shake to combine. Generously pour the dressing (you will have some leftover for salads later in the week) over the kohlrabi. Mix around to cover all of the kohlrabi. Break off pieces of the dill frond and toss it into the salad. Sprinkle with a little kosher or Malden sea salt to finish. For best results let the salad sit in the fridge or counter for 30 minutes or so before indulging. For this recipe I used Tuscan Market's tangerine white balsamic. I am so ready for the CSA season to begin. Do you belong to a CSA? What do you look forward to every season?